Not much at the moment. A Forge World Mars Alpha Pattern Leman Russ Vanquisher with Coaxial Heavy Stubber, filter, trench rail modification and a Death Korps of Krieg Tank commander with Heavy Stubber. I only did not use the trench rails on the kit, they were too much WW I for my taste. Otherwise it was a nice change from all the WW II tanks I painted the last years, I could also put all my tank painting skills to good use, pigments, washes, weathering etc. Please note also the red brown colour of the barrel, I common look in late war WW II on German tanks when barrels had to be replaced in the field and there was not enough time to properly paint them. 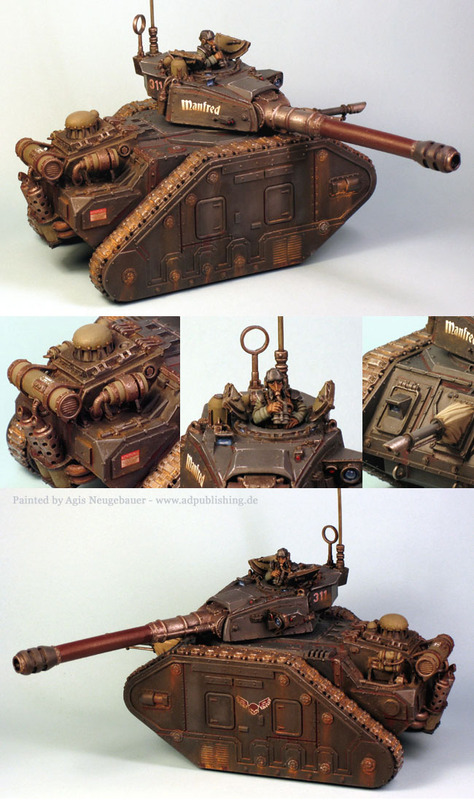 I chose a early war German tank colour scheme, IMO very fitting for the Death Korps of Krieg with their German name and look. The transfers are from DUST and WW II models. The heavy weathering and rust was chosen since the Siege of Vrak book is always stressing the point how sulphurous and corrosive the atmosphere is. The funny story behind the tank is that I received it free from FW, I ordered some small parts in December, received them all and in addition the Vanquisher was also included! Still not sure if it was a Christmas gift to a loyal customer or by accident! Just a test model. I used the torso and head from Victoria Lambs conversion kit and a plastic Catachan Fighter. Maybe I add some Penal trooper to an eventual DKG army.